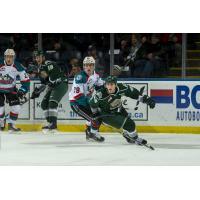 The Kelowna Rockets fell to the Everett Silvertips 4-2 on Wednesday night at Prospera Place in Kelowna, B.C. Kelowna got on the board early in the game with a power play marker. Everett's Connor Dewar was called for tripping 1:05 into the game, Lassi Thomson (8) bombed a one-timer past Silvertip goaltender Dustin Wolf at 2:57. Everett forward, Bryce Kindropp (20) tied the game with 11 seconds left in the opening period. The two teams entered the first intermission tied at one apiece. Connor Dewar (29) gave the Silvertips their first lead of the night at 9:44 when he got a shot past Rockets starter James Porter while on the power play. With two seconds left in the period, Thomson (9) scored his second of the night to tie the game once again. Just like the first intermission, the two were tied after 40 minutes of play. Kindropp (21) scored his second of the night at 11:56 in the third period to give Everett a 3-2 lead. Gianni Fairbrother (6) scored an empty net goal to Silvertips lead to 4-2. Kelowna's record is now 17-19-3-1. James Porter stopped 40 of the 43 shots he faced, his record is now 5-8-2-1. Everett outshot Kelowna 44-24. The Rockets now head to Prince George to face the Cougars in back to back games on Friday and Saturday at the CN Centre. They'll return home to host the Moose Jaw Warriors on Wednesday, January 16th for Hat Trick Wednesday. Tickets are on sale at selectyourtickets.com, at the Prospera Place box office or by phone at 250-762-5050.